Hey, friends! 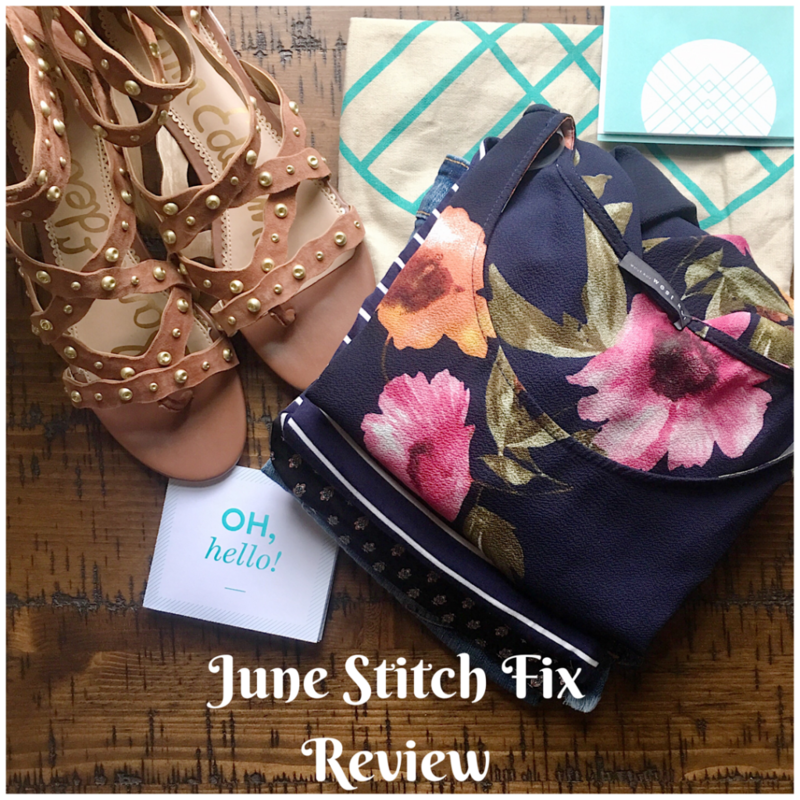 I’m so excited to share my June Stitch Fix Review with you! Summer is one of my favorite times of the year. It always represents such freedom having all of my kids home with wide open days to do as we please. But while summer is freeing, it’s also flying by and jammed packed with traveling, cookouts, catching up with friends, and days by the pool soaking up the sun. Needless to say, I have absolutely no desire to spend any of these fleeting moments in a store trying on clothes when I could be lounging poolside with my kiddos instead. 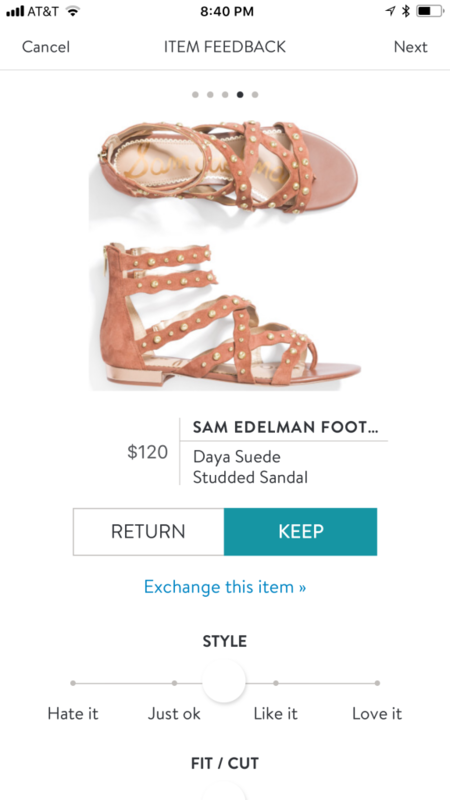 Enter my friend, Stitch Fix. No muss. No fuss. Sent right to my door. All the praise hands! 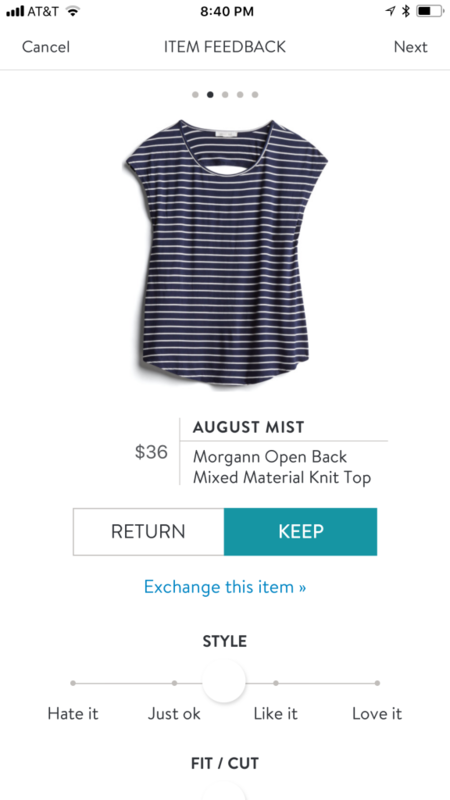 Stitch Fix is an online styling service that provides you with 5 pieces personalized to you. Items range from clothing to shoes to accessories. 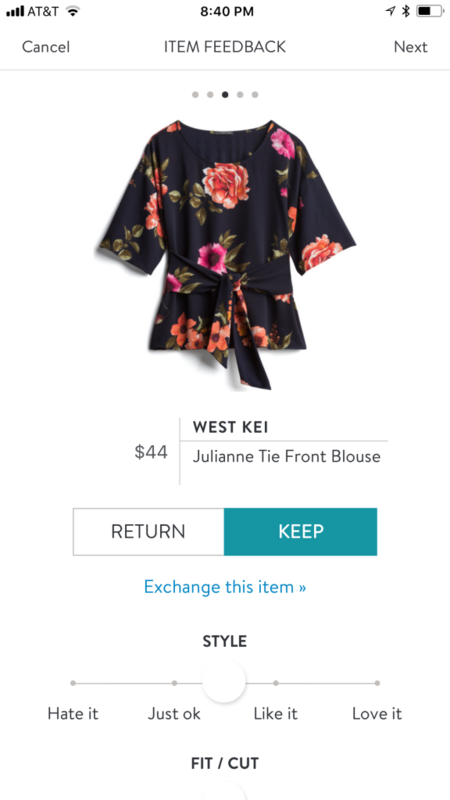 When signing up for Stitch Fix, you fill out a style profile to give them an idea of your price range, body shape and size, preferences, and style. You also have an opportunity to write a note to your stylist explaining any specifics for that fix (i.e. particular needs, upcoming events, must haves, etc). Unlike most subscription services, there are no set number of required fixes. You can sign up for as often as monthly or simply schedule them along the way as needed. After you sign up, you are charged a $20 styling fee, which is then applied to any items you decide to keep. If you love and keep all 5 items, there is a 25% discount applied to your entire purchase. Once they are mailed to you, you have 3 days to choose what you like and what you don’t, check out on an app on your phone, and then throw the pieces you don’t want into a prepaid envelope they provided and pop it back in the mail. Super simple and you never have to leave your own home (can I get an Amen?!). You can also check out my post How To Get The Most Out Of Stitch Fix for more Stitch Fix tips. 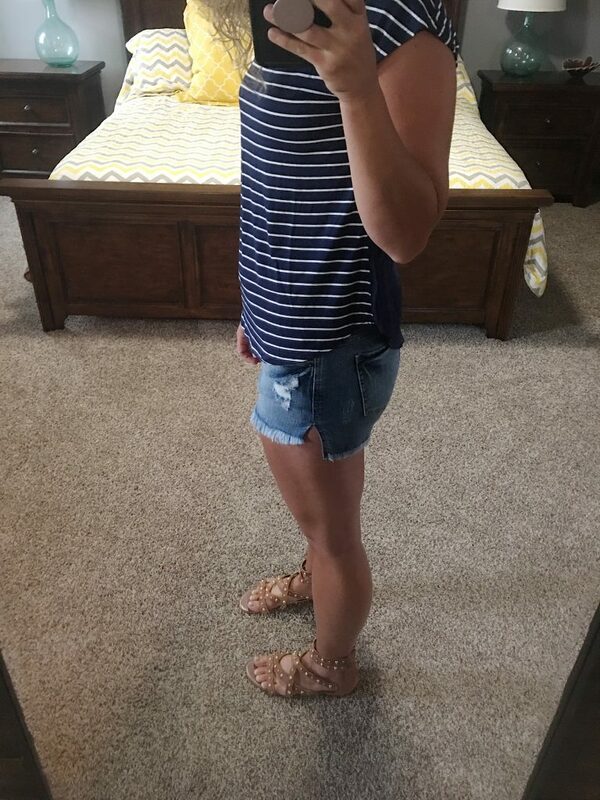 In this fix I asked for another all things summer fix with tanks, casual dresses, a second attempt at summer sandals, a romper, and shorts. I will also note that my usual stylist, Courtney, was not available for this fix, so my fill in stylist, Kelly, did not have any previous experience styling me. Sam Edelman Footware Daya Suede Studded Sandal. These were so amazing! Extremely comfortable with this awesome detail of studs that made them even more special. I loved everything about them, EXCEPT the price. Last fix I received yet another pair of adorable suede sandals that I returned because I didn’t think $90 suede sandals seemed practical for our laid back Midwest summers. I’m looking for a sandal I can throw on and go to a barbeque without worrying if the kids and the dirt will ruin them. These gorgeous sandals came with an even heftier price tag of $120, so we actually went backwards on this one. I did love the shoes though, so I did a quick search on line and found similar versions on sale at Nordstrom here in four colors and here in two colors. I plan to keep an eye out for them to see if the price drops more at the end of their season sales or their upcoming Anniversary Sale. 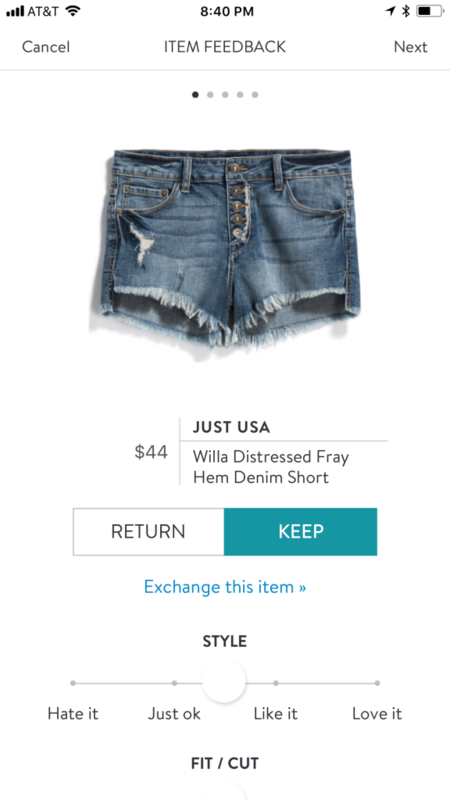 Just USA Willa Distressed Fray Hem Denim Short. I loved the idea of these shorts with the frayed hem, distressed details, and button fly. Plus they had a really great stretch to them making them super comfortable. The inseam on these is shorter in the front than the back giving them an even more casual look. The rise is high, which is exactly what this mama of four requires of pants, because, kids, and comfort, and the sheer joy I experience in not having to worry if things are hanging out as I wrestle with my three year old. And while the rise allowed me to lay down that fear of things hanging out as I bend over to pick up a child, the length, my friends, did not. These shorts were short. Too short for my taste. I felt a little more spring break than summer vacation with the fam. August Mist Morgann Open Back Mixed Material Top. I really loved this top. I adore everything stripes. Seriously, friends, look in my closet and you will see an abundance of striped clothing. It had a really great laid back style that seemed perfect for running around with kids. The top also has a super cute cut out in the back giving it a special detail that set it apart from your basic striped cotton tee. However, it is just a basic cotton tee, and I prefer paying less for my basics. At $36, I felt like I could find something similar somewhere else for less. And I did at Nordstrom. This BP Relaxed Cotton Blend Tee is only $15, which is much more my basics price point. 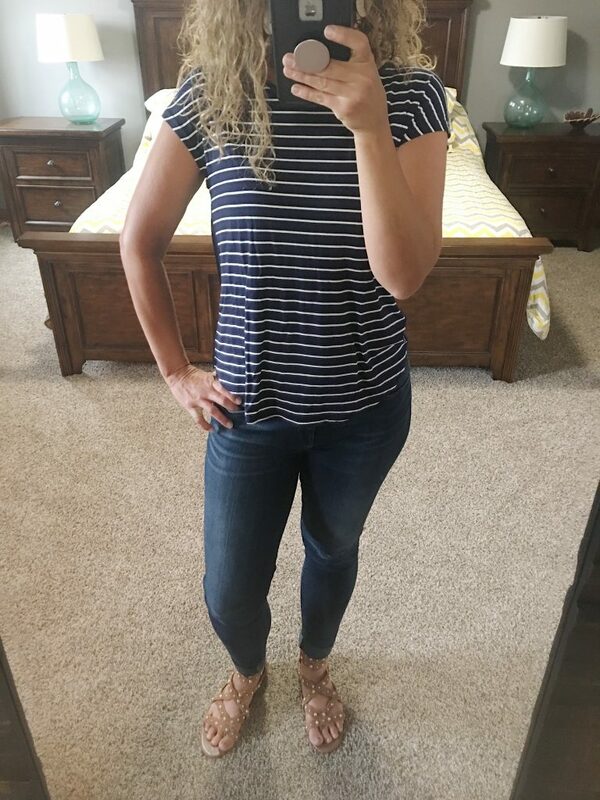 I also love this Carlson Rounded V-Neck Tee that is going for $25 right now, but I picked up the black and white version for $15 at the last Nordstrom Anniversary Sale, so I’ll keep an eye out for more deals on great basics in the upcoming Anniversary Sale. 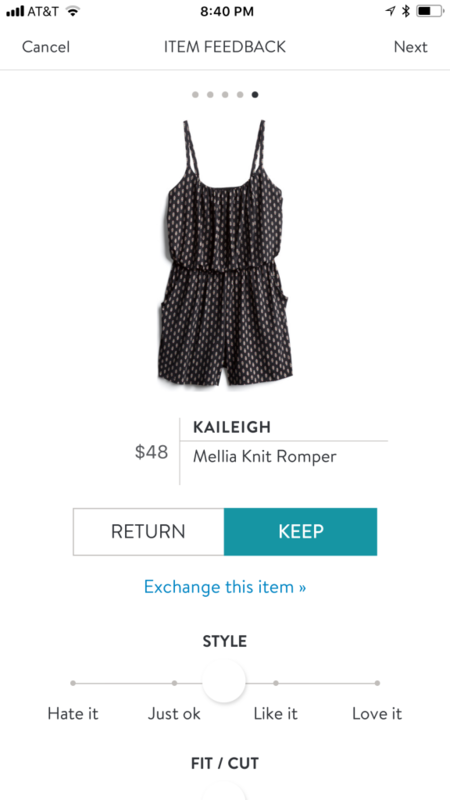 Kaileigh Mellia Knit Romper. I asked for a summer romper, and this was so cute, and so comfortable, and had pockets, so it had all those things going for it. But once again, I was disappointed that I was not really heard from my commentary on the last fix…I specifically said that I am not a spaghetti strap kind of girl after receiving the Papermoon knit Maxi in my May fix, and yet here we are again with spaghetti straps. In my stylist’s defense, she was filling in for my usual stylist who was unavailable this time around, so she may have missed that detail. 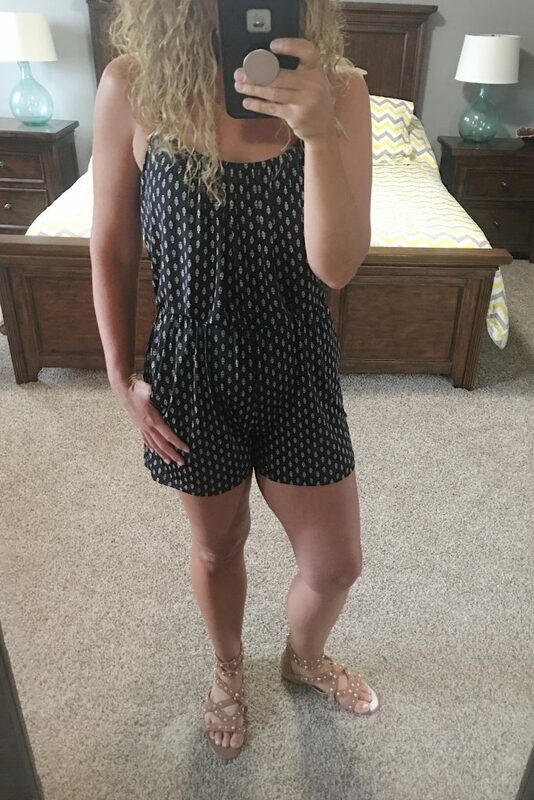 If you don’t mind spaghetti straps, I highly recommend this romper. I would suggest sizing up if you are long waisted though for a better fit. West Kei Julianne Tie Front Blouse. At first glance, I was disappointed to see a mid sleeve blouse in a summer fix…because heat! But once I got it on, I fell in love! This top is super versatile and could really be worn any season. It’s lightweight enough to wear (in air conditioning) in the warmer months, but the mid sleeve and navy could work for the cooler months, too. The blouse is so comfortable, which is always a key selling point for me! I also loved how it was flowy, but had the added tie detail in the middle to define my shape. It was different from anything else in my closet, so felt like a great addition to my wardrobe. So what’d you think of this fix? What essential pieces are you searching for this summer? 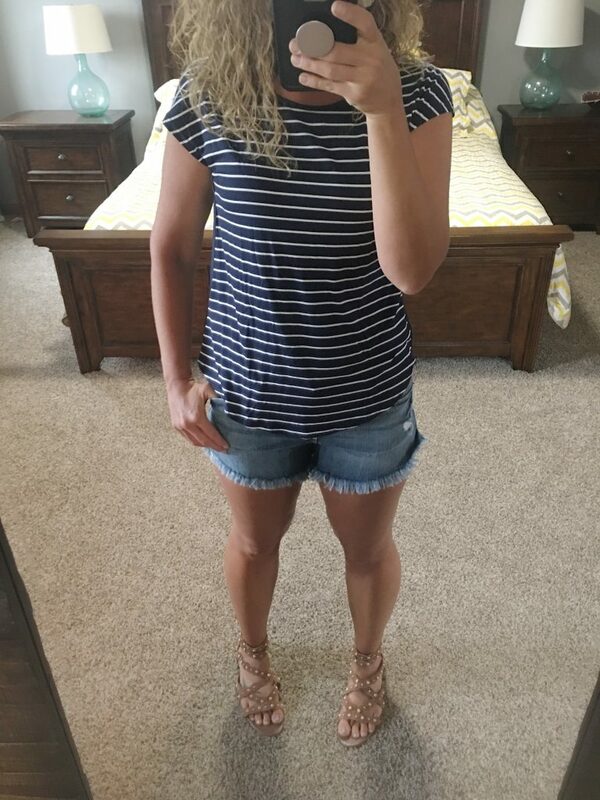 If you’d like to see more Stitch Fix style you can check out my last fix, and follow my Stitch Fix Style Board on Pinterest to get these style cards and much more to pin for your own stylist. 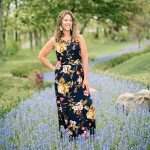 If you love Nordstrom style, check out my last Nordstrom Review and stay tuned for my Anniversary Sale picks. Do you Anniversary Sale shop? If so what pieces are you looking for the most? Mama In the Midst uses affiliate link programs. Thank you for clicking around my site!! Great write up and loved the tips on similar pieces for less!! Thanks so much! I always like to find a look for less! 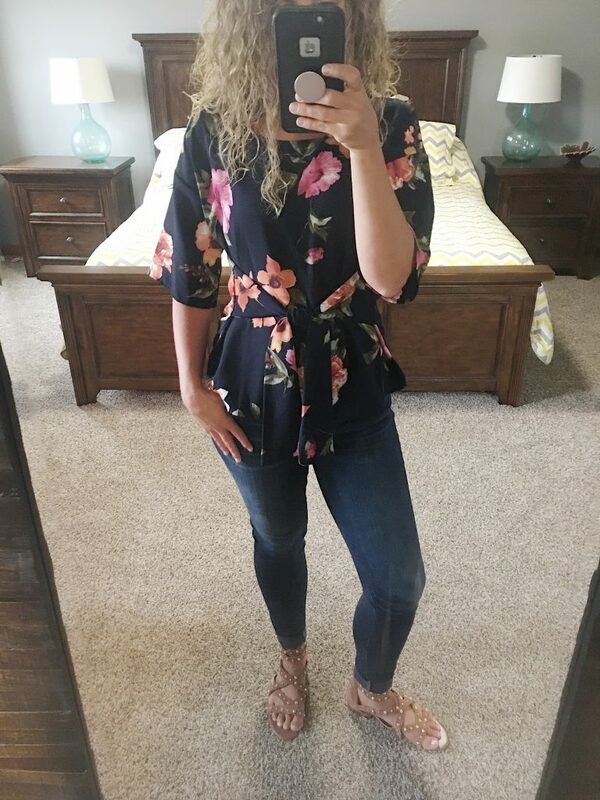 I love that floral top!! I’m pinning this one! Thanks!! I did, too! Happy pinning! !